Trying it out myself and compared to DCU online not initially impressed. I stopped after a few minutes myself but will try again. I can't seem to pan around to see my characters front and the movement seems very clunky as does the interface but maybe I'll get used to it. I really like the champions universe so I hope so. In DCU online I immerdiately felt really hardcase and super. Hopefully I'll get the feeling here but not yet. I must confess the interface confuses me. I've leveled up several times but don't know if I need to make decisions or if so how to do anything. do I get to pick new powers etc. yet? I'd really prefer a mouse click attack option. I seem to have no travel power at first either? 1st level you start out with "2 feets" travel power. The biggest thing that CO is missing to me is voices. I wish there were more NPC dialogue. DCUO was awesome for that. DCUO otoh seemed to be so much button spamming to me. I played DCUPO and I do play CO with a game controller as well as the keyboard/mouse. With DCUO I just spammed the X button. In CO I get to mix it up some more. You will be able to train once you leave the tutorial zone. If you skipped it, you may want to start a new character to get the info there. You could look at remapping your keys if you like using your mouse keys to cause attacks. Check Options > Key Binds. There's elements of CO, COX, and DCUO I wish I could bring together to make an awesome supers MMO. I think I'm getting the hang of it. I like how the citizens comment when you rescue them. DCUO is more epic to start with but I'm really enjoying the super jump. Now that I've got a targeting lunge power for my "Behemoth", I'm doing better. Is there a way to make a male behemoth who looks human ( got that part) and doesn't have that lumbering run and stance? I'm wanting a golden age Superman thing. Is there a way to make a male behemoth who looks human ( got that part) and doesn't have that lumbering run and stance? I'm wanting a golden age Superman thing. Pick the stance type you want and look at fine-tuning your character's dimensions. The following image is spoilered for size but you can see how many adjustments you can make. There are several options for stance (Normal, Heroic, Bestial, etc), but I'm not sure they affect how you move. So far I've tried out flight, superleap, teleport, and supespeed. I like flight the best, though superleap is fun. I'm heroname thunderchild99 and so far I've just got Thunderlegacy. Silversteak's daughter ( also Silverstreak ) is a mainstay in my campaign, Hell's angel was Julie's ( my wife"s) character and the Man-ape and Alexi Toeshin were my characters so yep , I recognize them. 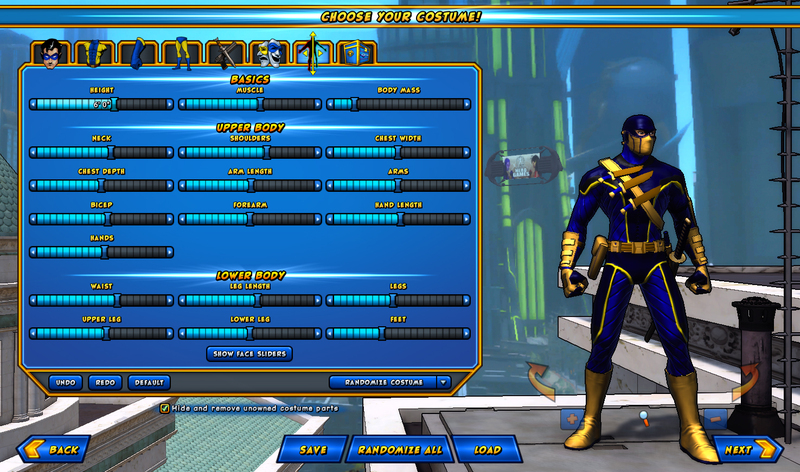 I've got aboatload of DCUO characters though. I still prefer it but champions online has its moments. Travel power unlocks at level 6. The tutorial is there so you can learn the system and interface. I have lifetimes to both games and play CO more than DCUO for a few reasons. 1) genuine character customization options beyond 3 color pallets. 2) about ten times the costumes, and more of the COH holdovers. I desperately wanted DCUO to excel, it lacks a lot and the fact is the travel powers are nice but very by the numbers. I would do backflips if either DCUO or CO were to embrace COH's alignment system.